Bentley delivered 7,003 cars in 2011, it's second-highest annual total ever. BERLIN -- Volkswagen AG superluxury brand Bentley is planning "robust" growth in sales and higher profit this year as wealthy consumers end the spending restraint brought on by the 2008 recession. "Customers have become tired of pushing back purchases year after year and are returning to old buying habits," Bentley CEO Wolfgang Duerheimer said today on a conference call with reporters. "If the economy doesn't let us down, there's a good chance that we can approach the 2007 record" in deliveries this year. Bentley sold 37 percent more cars in 2011 as demand for the Crewe, England-based manufacturer's models doubled in China, helping make the brand profitable for the first time since 2008. The VW unit recorded an operating loss of 245 million euros ($320 million) in 2010. Bentley, which was founded in 1919 and competes with BMW AG's Rolls-Royce, had its best sales year in 2007 at 10,014 cars. Deliveries last year totaled 7,003 vehicles as China overtook the UK to become the brand's second-biggest market, after the United States. Sales will probably rise by a "robust" double-digit percentage this year and profit should exceed 2011's figure, which hasn't yet been reported, Duerheimer said. 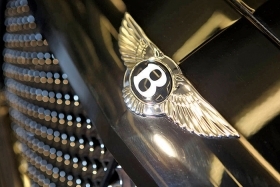 Bentley posted a 6 million-euro operating loss in the first nine months of 2011. Its last annual profit was 10 million euros in 2008. "In the context of Volkswagen's roughly 11 billion-euro earnings before interest and taxes, that's not huge," said Adam Hull, a London-based WestLB analyst, who recommends buying VW shares. "But it is encouraging and it bodes well." Volkswagen's preferred shares rose as much as 3 percent to 123.35 euros, the highest intraday price since Dec. 12, and were up 2.5 percent at 1:18 p.m. in Frankfurt. The stock has declined 3.8 percent in the past 12 months, valuing the Wolfsburg-based carmaker, Europe's biggest, at 53 billion euros. Bentley aims to take advantage of the stronger demand by adding 25 dealers this year to its current 161 sales outlets worldwide. Expansion will focus on China, Russia and mainland Europe, with sales in the United States expected to grow at its existing distribution network, Duerheimer said. Sales growth is expected to be fueled by deliveries of the new Continental GTC convertible. The model, which starts at $205,600 according to auto-pricing site Edmunds.com, helped push December sales up 69 percent to 1,059 cars, Bentley's second-highest monthly sales ever, the VW unit said today in a statement. New V-8 engines for the entire Continental line will also boost demand, Duerheimer said. The carmaker plans to expand its lineup and expects to decide in the first quarter on adding an SUV, which would be priced at more than $140,000, Duerheimer said. The company is also considering an extended-wheelbase version of the Mulsanne and more variants of the Continental, he said. Bentley's full-year deliveries in the U.S. rose 32 percent to 2,021 cars. Mainland European sales jumped 53 percent to 1,187 units, while "challenging" conditions in the UK held back growth in that market to 5 percent, with 1,031 vehicles sold, Bentley said. The Continental GT was the brand's best-selling model, with 2,404 deliveries, the carmaker said.